Erasmus+ is the EU's programme to support education, training, youth and sport in Europe during the period 2014-2020. Education, training, youth and sport can make a major contribution to help tackle socio-economic changes, the key challenges that Europe will be facing until the end of the decade and to support the implementation of the European policy agenda for growth, jobs, equity and social inclusion. Erasmus+ combines the former lifelong learning programme, youth in action, sports as well as the higher education cooperation programmes. The programme has an overall budget of about €14.7 billion. Erasmus+ will provide opportu-nities for over four million Europeans to study, train, gain experience, and volunteers abroad. The objectives of this programme involve the optimization of competencies and employability and the modernization of systems for general and vocational education and for youth policies. Further information about Erasmus+ are available at the website of the European Commission. At the moment 33 countries take part in the ERASMUS+ programme. These include the 28 EU-countries as well as Iceland, Liechtenstein, Norway, Turkey and Macedonia. Furthermore several Overseas Countries and Territories (OCT) are eligible for Erasmus+. 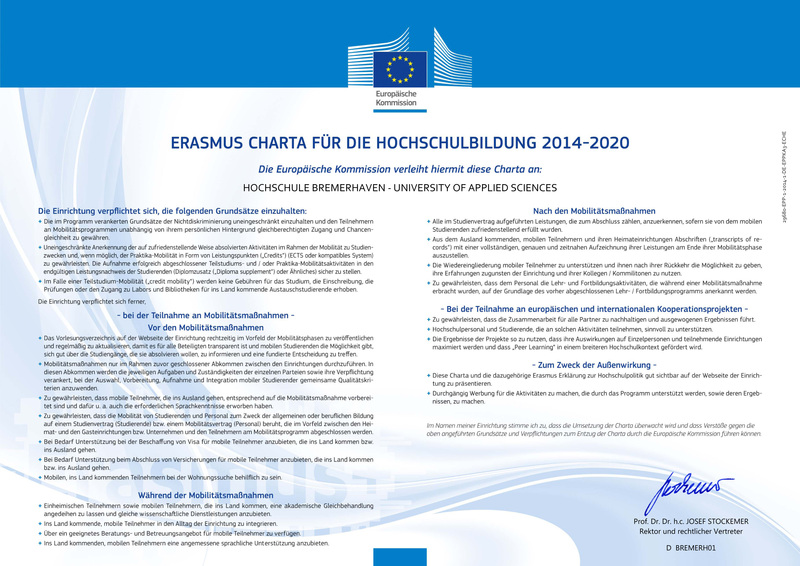 By signing the Erasmus Charter for Higher Education (ECHE), higher education institutions like Hochschule Bremerhaven – University of Applied Sciences commit to provide all the necessary support to participants of the Erasmus+ programme, including linguistic prepara-tion and to consider all further principles of the ECHE Download Erasmus Charta einpflegen. Further information about the international strategy of Hochschule Bremerhaven – University of Applied Sciences and its strategy for the organization and implementation of international cooperation projects are available in the ERASMUS Declaration on Higher Education Policies. The Erasmus+ Student Charter includes your rights and responsibilities as participants of the Erasmus+ programme. 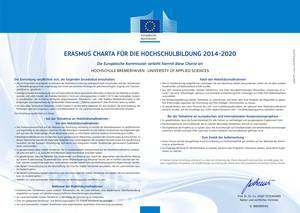 The Erasmus code of Hochschule Bremerhaven – University of Applied Sciences is: D BREMERH01. a) Students may receive an EU grant as a contribution to their costs for travel and subsistence during the period of study or traineeship abroad. The financial support depends on the costs of living in the participating countries (the so called Programme Countries). b) Students and recent graduates carrying out Erasmus+ traineeships will receive an additional top-up with a minimum amount of 100 EUR per month. Therefore group one obtains 350€, group two 300€ and group three 250€. The amount of the monthly funding rates is adjusted each year and can differ between the project years 2015, 2016 and 2017. The amount of financial support for staff mobility for teaching and training depends on the different costs of living in the countries of destination. There are fixed daily rates for the individual support for staff sent out by German universities. In addition to these daily rates, travel costs will be covered depending on the real distances between the point of departure and the destination of the mobility. These distances are determined with the help of the distance calculator. Handicapped people can get an extra grant for additional costs within the ERASMUS stay. This applies for all ERASMUS monbility lines. Students, who take their child/children to an ERASMUS+ study stay in a program country and are a single parents during the Erasmus+ mobility, can get extra funding as a lump-sum. The maximum monthly funding rate is set through three country groups. Repeated funding through Erasmus+ is possible. Students can get funded multiple times for study stays and internships/practical stays (also graduates) in program countries, up to an overall funding period of 12 months per study cycle. Fort each (new) funding applies the minimum duration of two months for practical stays/internships and three months for study stays. In each study cycle, the months that got funded by ERASMUS or LEONARDO DA VINCI in the program of Lifelong Learning (LLP) will be credited to the maximum of 12 months for each study cycle. Participants in long-term mobility activities can benefit from linguistic preparation. In this regard, an online linguistic support is gradually implemented in the course of the Erasmus+ Programme. Such online support is made available by the European Commission to selected students, with a view to assess their competence in the language they will use to study and work abroad. This tool also offers them, where necessary, the possibility to improve the knowledge of the language before and/or during the mobility period. The European Commission provides online linguistic support in Bulgarian, Croatian, Czech, Danish, Dutch, English, Finnish, French, German, Greek, Hungarian, Italian, Polish, Portuguese, Romanian, Slovakian, Spanish and Swedish (level A1). At the end of the mobility period abroad, all students and staff who have participated in the Erasmus+ programme are required to complete and submit a final report through the mobility tool+ together with further documents of their stay abroad. Information about the required documents can be found on the corresponding pages of the student and staff mobility. In the Institutional Factsheet of Hochschule Bremerhaven (D BREMERH01) you can find more information about the contact persons at the International Office, some general information about your application to Hochschule Bremerhaven, the grading system and practical issues like housing and visa applications.